Over the past few months, few things have driven home the overblown panic surrounding fat people than this recent article on the Hopper Home Bunny Blog declaring an “obesity emergency” among pet rabbits. That’s right. Although rabbits consume the lowest amount of “junk food” among household pets at 26%, they are BLOWING UP at an alarming rate. 26% of British Bunnies apparently equates to over 430,000 rotund rabbits! These thousands of rabbits are “at risk of developing obesity related and certainly life-threatening disease if their diets don’t improve.” Lock up your children! Stay indoors! Somebody better develop Lapin Band surgery for these corpulent cottontails. One week later, this statement came out demonstrating the moralistic food police in a total tizzy over trick or treating. UPI hosted a statement that pointed out that kids gather between 3,500 and 7,000 calories during trick or treating. Oh the horrors! They even noted that (gasp) the U.S. President and First Lady handed out CANDY to trick or treaters at the White House. Donna Arnett, head of the department of epidemiology at the University of Alabama at Birmingham School of Public Health suggests that people give kids money instead of candy (because kids love money), and that parents hand out pedometers to their kids and give a prize (non-food of course) to the kids with the most steps. Okaaaaay. Well we’re smack dab in the middle of this holiday season, and I wonder, who else is going to be implicated in this obesity epidemic? Will we truss up St. Nick next to the holiday turkey and serve him up as a bad role model? I mean, that guy could stand to lose a few, right? Are we going to put Baby New Year on a diet? Maybe that kid could live longer than a year if he ate a little broccoli, right? And the prescription for the Easter Bunny goes without saying (see above). I’d like to suggest that we all take a holiday from weight obsession. Can we take a few weeks to work on managing our stress and getting a little bit of good sleep? Can we choose to enjoy holiday treats openly and while we’re hungry for them, rather than denying ourselves, and then closet eating all the Christmas cookies? Can we engage in regular, rational and pleasurable physical activity, rather than doing nothing until New Years and then weekend warrioring ourselves right into an injury? Can we all just take a deep breath and calm down? That’s my plan and my holiday gift to you. Sleep in heavenly peace my friends. This entry was posted in evil, fat, food police, holiday, holidays, moral, panic, rabbits, trick or treat on November 16, 2011 by fatchicksings. Amen, amen, amen. 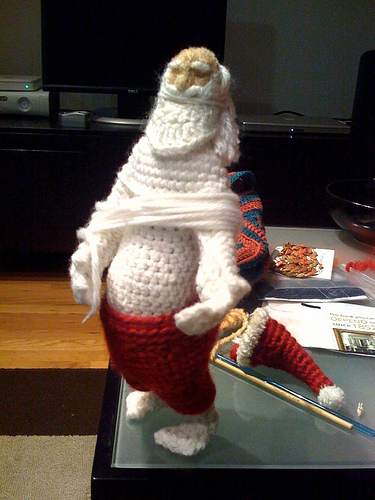 I was at the point Wednesday where if I saw one more story about how to NOT eat your Thanksgiving dinner, I was going to smack somebody.And as an occasional crocheter, I want, want, want that Santa pattern!